Online Store - Tracer Technologies Inc.
A great audio performance starts with our new Audio Performer software. This innovative new product allows you to create a stunning audio performance by using audio you already own or purchasing the fine license-free original audio performances that we sell. You don't have to be an expert in music, audio production or computers to create a wonderful original audio composition that will impress judges, delight crowds, and give your performer the best platform to succeed. Tracer specializes in all things related to Audio Forensics. Our software tools set an industry standard for affordable power. Our trainings are attended by law enforcement agencies, legal officials and private companies. If you have questions about Audio Forensics, don't hesitate to call our toll free 866 260 6376. With today's technology, you needn't leave the comfort of home to create a professional audio recording. If you have questions about setting up your home studio, contact Tracer toll free at 866 260 6376. Tracer has created a vast lineup of audio DVDs that will help you learn about sound, learn about Audio Restoration and learn about just about anything. If you have a question about which DVD is right for you, call us toll free at 866 260 6376. Tracer offers a huge lineup of audio products for your PC computer. If you need to do something with sound and your PC, we've got the products you need. If you have questions about selecting a piece of software, contact us toll free at 866 260 6376. Here are a couple of cool little products that will aid you when working with Video on a PC. Welcome to the 21st Century. These innovative hardware products allow you to take your favorite VHS videos, slides, and film negatives and scan them into your PC. Digitize your memories! The best part...digital never gets yellow! The world of PC video has changed dramatically over the years. This collection of cool PC video devices lets you easily interact between your PC and your treasured VHS tapes, slides, 35mm Photos, negatives, etc. Our specialty is audio restoration. This category contains every product you could possibly imagine for taking your favorite records and tapes and restoring them to their past glory. You'll be amazed at how good your treasured recordings can sound. 78 Records, 45 Records, 33 Records, Cassette, 8-track and Reel to Reel tapes? We make them all sound like the day they were recorded. Better yet...we actually answer our phones, so if you have a question, call our toll free number and we'll talk to you. 866 260 6376! We boast an impressive lineup of Forensic Audio products and work with some of the best companies in the world that specialize in Audio Forensics. Law enforcement agencies in over 40 countries use our products every day to help clarify and enhance sound evidence in diverse formats. If you're going to record using your computer, your sound card is the gateway you'll need. Our selection of high quality sound cards give you the sterling fidelity you expect from a digital recording teamed with the great price and support that have made Tracer famous. If you have a question about your computer sound, don't hesitate to call us...we actually have phones that we answer. 866 260 6376! We come across hundreds of folks who, for whatever reason, have in their possession, a piece of important audio evidence with which they have no clue how to handle. In many cases, there are recordings of obscured voices buried in an ocean of noise and they need advice on the viability of these recordings and a path on how to proceed. At Tracer Technologies, we have 25 years of audio cleanup experience, the best tools in the business at our disposal and a wealth of good level-headed advice so you won't get caught in over your head. What Do I Do With My Recordings? First, we'll have to evaluate your recordings to see if they can indeed be cleaned and clarified. If you provide us an MP3 or .WAV format, we'll run our evaluation process on the recording for $129 and let you know if you have a chance to have success and a cost for how much it would be to process that recording and deliver results you can understand. This affordable evaluation can save you from throwing away your hard-earned money chasing after companies that will make you pay in advance, use inferior tools on your file and hand back an unusable result. Our Forensics experts train law enforcement agencies at local, state and federal levels all over the world on how to achieve maximum success with obscured voice recordings...if we say it can't be fixed...trust us...it can't be fixed. Call Toll Free...866 260 6376...We'll help. 1. I have a recording with some speech that I am trying to clean up so it can be heard. Can you do that? No one can tell you that without hearing at least a representative sample of the audio first. Unlike what you may see on CSI, there are no "miracle", "one button", or "magic" audio restorers. Many recordings can be improved, but some cannot. 2. Can I send you a sample to evaluate? Yes, You can send us 30-60 seconds of your audio and we will evaluate it to see if speech can be recovered. In most cases, we will send you this audio back so you can hear the results of the processing. We may or may not be able to recover speech in a recording, but we WILL be able to tell you if it can be done. 3. What does this evaluation cost? Experts can be very expensive and must charge for minimum amounts of time. We will evaluate your 30-60 second sample you send us via email and let you know if it can be recovered. This service costs only $129. Important Note: You must send us only 30-60 seconds and it must be sent via email. This allows us to efficiently respond to your requests and evaluate your audio quickly for a very low price. Longer evaluations are available at our normal hourly rate. 4. How do I get a 30-60 second sample of the audio? Most of our customers already have the audio in a wave file and can easily create a 30-60 second segment to send us. If you don't know how to do this, the first try to use the software that came with your digital recorder to extract the audio from the recorder. Please use that method if you have it. We would like to have the audio in Wave format if possible. Please DO NOT convert to MP3 or other formats if you already have a wave file - just send us the 30-60 seconds of that. If you are unsure how to get the audio into a file so you can email it to us, you can find a detailed method of recording the audio from your digital recorder below this questionnaire. 5. What will I receive back from you and when will I get it? You will receive an emailed document with our opinion as to whether it is possible - given the state of the art today - to recover speech from your recording. In most instances, we will send you back a processed version of your audio showing either how good the speech recovery is, or how impossible it is to hear and enhance the speech. You will receive the result in approximately 3 business days. Important Note: You are not buying a speech recovery service, you are buying an expert opinion as to whether it is possible to recover the speech. 6. If it is possible to recover the speech in my recording, what happens then? This depends on a lot of factors. You will certainly want to call us. You would buy our software and do the restoration yourself with our help. Or, we could refer you to an outside expert who would do the work for you and could testify in court if needed. 7. I have one more question. Just call us with it at 866-260-6376. First, let's talk about the recording. We have to get it in the proper format so that it can be evaluated using our tools. If you have a portable digital recorder, telephone or some other device that holds this file, you'll want to make the best recording possible. We have a tool that will help you record...you'll just need to wire things into your computer's sound card to make the recording. Normally, your device will have a headphone jack on it. You simply need to find a cable that plugs into the headphone jack that also will plug into your sound card's line input. (Virtually any employee at Radio Shack can help you with this). The computer input is a known source...it's either an 1/8 inch mini stereo jack...also known as 3.5mm. Again, you'll want the Line Input on your computer's sound card or chip. A Mic input is the last resort, as Mic inputs use small amps which are cheap and noisy. We're trying to eliminate noise here...not increase it. Practically all Desktop machines have the following look...you'll want the Blue jack. Our Diamond Cut Software products are the best in the world for recording, cleaning and editing audio. For this particular project, we can simply use a demo version of our popular DC EIGHT software. Just download the demo and install it on your computer. Once you've successfully completed the install, simply launch the product. Essentially, the software is going to turn your computer into a big tape recorder...you'll wire up the audio output of your digital recorder or telephone or...whatever and plug it into the line inputs of your computer. Now, the software will monitor those inputs and record the results to your hard disk. We're hoping to get about 30 seconds that best represent the recording you have. Because we'll be uploading this file, we don't want it to be too huge. This will launch the recording screen of DC EIGHT. Let's see if we have levels. Just click on the Pause Button. It's just to the left of the red record button. This turns on the recording channels without actually recording anything. Now, start your tape player or phone playing and you should see the green level meters start jumping to the sounds your device is making. Your green level meters should be registering right in the middle of the scale. You don't want too much gain here. If your levels are too high or too low, just click on the "Adjust Levels" button in the recording window...this will launch your sound card's mixer and you can turn the line input gain up or down. Once you're happy with the level, simply make sure you're at the point of the recording you want to record and then hit the "Record" Button. Now the software will record the output and create a new file. Record roughly 30 seconds and then hit the Stop Button. You can then hit the Save button to save the file you've just recorded. Now you've got the file, just click on the PFI product below and we'll have you pay and upload your file for evaluation. Our Forensics experts will load your file into our system and run a series of tests to see if there is a chance to clarify your recording and get the results you seek. If we are able to process this file, we'll contact you, find out additional details and be able to give you a very accurate quote on completion of the work. Our lives are full of memories of all types. Many of those voices from the past. Whether they be treasured Holiday Albums we remember from our child hood, or recordings of loved ones no longer present. In many cases, those recordings are part of vinyl or tape collections that are fading each and every day. Tracer sells the worlds best audio restoration tools...but what if you don't have the time or the skills to clean these recordings using your computer? What if you only have one record and just can't justify buying our software to clean one record or tape? At Tracer Technologies, we have 25 years of audio cleanup experience, the best tools in the business at our disposal and a healthy reverence for classic audio. We'll take those recordings, remove the noise of age and poor recording techniques and deliver you a new CD that sounds as if this memory happened yesterday. How Do I Get These To You? If you provide us an MP3 or .WAV format, we'll clean the audio for you and spit out a new CD for $39 per record. Your audio hasn't sounded this good since the day it was recorded. First, let's talk about the recording. We have to get it in the proper format so that it can be processed using our tools. If you have a tape, LP or 45 that is the current source of this material, we have a tool that will help you record...you'll just need to wire things into your computer's sound card to make the recording. You simply need to find a cable that connects the audio outputs of whatever audio system you have to your sound card's line input. (Virtually any employee at Radio Shack can help you with this). The computer input is a known source...it's either an 1/8 inch mini stereo jack...also known as 3.5mm. Again, you'll want the Line Input on your computer's sound card or chip. A Mic input is the last resort, as Mic inputs use small amps which are cheap and noisy. We're trying to eliminate noise here...not increase it. Practically all Desktop machines have the following look...you'll want the Blue jack. Essentially, the software is going to turn your computer into a big tape recorder...you'll wire up the audio output of your audio device and plug it into the line inputs of your computer. Now, the software will monitor those inputs and record the results to your hard disk. We'll record the entire side, stop recording and record the other side, so you should have 2 large recordings. 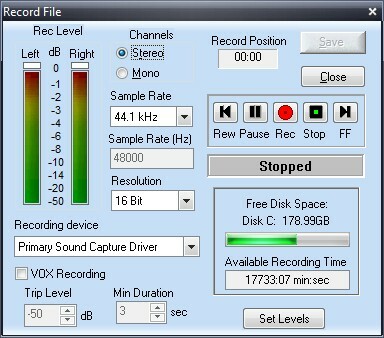 Record your audio and then hit the Stop Button. You can then hit the Save button to save the file you've just recorded. Now you've got the file, just click on the Treasured Recording Services product below and we'll have you pay and provide instructions for getting your file to us. Our audio restoration specialists will load your file into our system and remove a majority of the clicks, pops and hiss and enhance the remaining audio so it sounds the best it can. We'll then burn a CD for you and return it postage paid. These special bundles come with special Tracer instructions so that implementation and setup is a breeze.